Today, South Korea is known as one of the most hi-tech nations in the world. It has advanced infrastructure, is embracing smart devices and is even looking towards the future with intelligent urban areas known as U-cities, which should be completed in the next couple of years. It also claims masses of the world's various IT markets; capturing 27.5% of the mobile phone market, 37.8% of TV, 51.7% of memory, and 52.9% of display panel market shares. But this wasn't always the case. 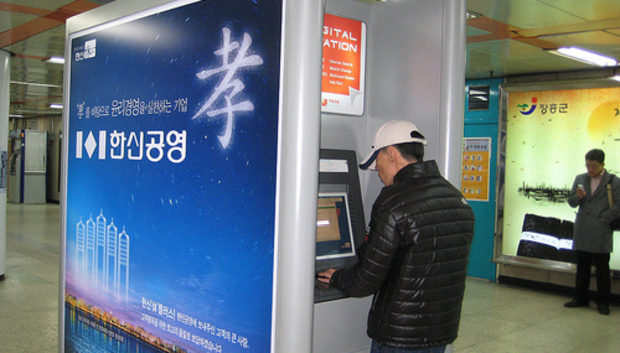 Shortly before the new millennium, the Korean economy experienced its worst recession since the Korean War. However in a couple of years, not only had the economy recovered, but was in better shape than ever. And this almost entirely down to the IT sector. Throughout the recession period the IT sector continued to grow rapidly, ‘spurred by the development of a number of new technologies including mobile phones, thin film transistor-liquidity crystal displays (TFT-LCD), Internet-related industries, broadband, digital-TV, and wireless Internet', along with traditional sales of PCs. Within two years, from 1997 to 1999, mobile phone subscribers tripled, and between 1998 and 2000, internet users multiplied five-fold. In the space of a few years, the country went from average to one of the biggest consumes of digital technology in the world. This shift was helped by a lot of factors. Before the economic problems, competition was scarce and electronics were expensive, but an array of new companies pushed down prices almost overnight, fostering growth. The population's high levels of urbanization (70% of South Koreans live in its seven largest cities) mean it's easy for the majority of people to access the internet, wireless services and places to purchase technology. Computers are engrained into the youth culture; many are avid internet gamers and bloggers, and those that couldn't afford computers of their own often frequented internet cafes. The high levels of literacy and quality education were also factors. Becoming specialists in hardware has been a massive plus, and has been a constantly growing sector for nearly over a decade, and still is today. Some might argue that the country is over-reliant on hardware (84% of the total IT industry), and in this cloud-driven world software development is the future, but the reality is that there will always be a place for hardware, and as devices become ever-more powerful and complicated countries with specialisms in creating them will benefit even more. Of course government assistance has also had a large hand in the tech-based direction that Korea has been taking. Laws surrounding IT were revised, including intellectual copyright, and back in 1999 the ‘Cyber Korea 21' project was unveiled. It promised to spend $24.8 billion by 2002 on upgrading IT infrastructure, providing training programs, and establish legal frameworks to vitalize e-commerce and the IT industry. The government encouraged private investments by promising to build a backbone network for high-speed communications public funds. Being early adopters of technology was a big factor. In 1995, South Korea had less than one internet user per 100 inhabitants. In 1999, it surpassed the developed nation average and by the end of 2002 was the world's fifth largest internet market, with 26 million users. This year Korea became the first country to reach 100% broadband, up from 89% last year. But the country's continued investment has been a big factor in its on-going status as a world leader. In 2009 with an eye on superfast fiber-optics, $152.3 billion was spend to develop IT convergence applications, software, key IT solutions, communications and the internet over the following five years. By the end of the year the Fiber-optic subscriber base had already reached 9.23 million. That figure has continued to rise to over 55% today. Smartphone penetration has hit 50%, equaling the likes of Australia, UK, Sweden and beating the US. But Korea is the clear leader when it comes to mobile broadband subscriptions, and today, while the UK is getting its first 4G enabled networks, Korea already has a penetration rate of 17% and rising. There isn't a magic bullet that shot South Korea to the top of the IT food chain. Rather, it was a range of factors; cultural, demographical, and governmental, that all gelled together. What is most impressive however, is that it is still a world leader, thanks to constantly renewing the desire to stay where it is. « Kasey Cassells (Global) - Is the iPhone 5 Worth the Wait?